So I have an affliction making stuff. I always have some project or other on the go. I get a whacky desire to make something and mull it over for weeks, months or years before having to start. 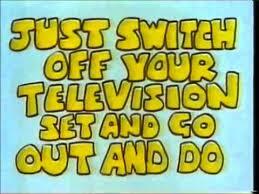 If I don’t start I just keep thinking about it and thinking about it! I am either planning, making, fixing or repurposing something. I have many projects on the go at one time. The perfect project is something that takes a long time and has many stages to it. It can evolve and be shaped. I love to spend time subconsciously sketching out in my mind how I can make parts, how I can adapt parts, how I can engineer something. Its those moments when I am waiting or daydreaming I will be engineering something in my head. Building the boys Jeep was a perfect example of this. It had lots of parts, it required research, it needed different types of skills and I had to adapt and repurposing things. The front steering mechanism was a problem I spent ages thinking about. I needed a way of having a 3 axis mount that could swivel in all three directions. Id sketch out diagrams, play with bits of metal, Lie in bed awake thinking how to solve the problem. Inspiration and a final solution came while in the local hardware store. Large eye bolts normally used for gates bolted together in an X-Y-Z orientation were a quick and reasonably cheep and strong solution. Relief, I can stop thinking about that problem. Both my boys sleep in custom beds I have made. 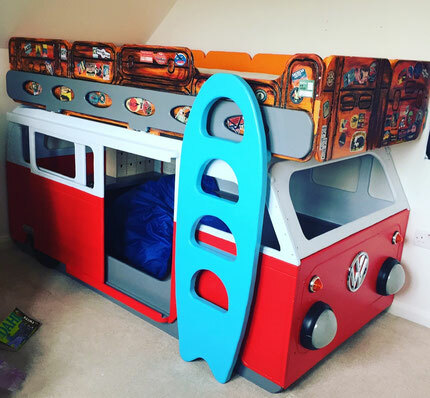 Jamie wanted a high sleeper in the shape of a Campervan, Thomas wanted a Pirate Ship. Both required research, planning and design. The Campervan was drawn out using a digital projector that beamed the outline of a Campervan onto a giant sheet of MDF that I then traced round with a black Sharpie. It has working lights and a real sliding door, and a surfboard as a ladder to get to the top bunk. 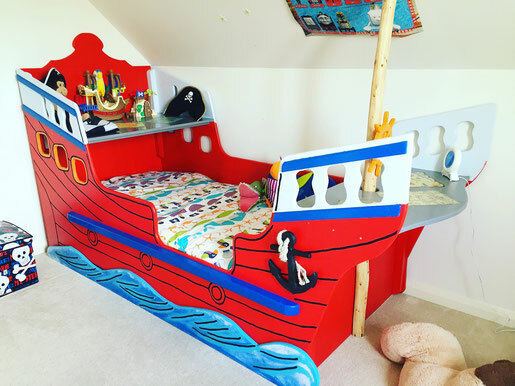 Thomas's Pirate Ship bed is a similar construction and has an anchor, a ships wheel and a bell (last orders at the bar type bell from Ebay). The anchor and ships wheel were cut out on my mini Xcarve CNC machine. I am a bit of a petrol head and one of the big projects I wanted to do was build my own car (I mentioned this in previous posts). My first attempt was to dismantle my mums mini clubman estate when it was parked up after terminally failing its MOT. I didn’t get very far. I was only 12 and had limited budget and tools. Years later I set about researching and choosing something new I could build, I had the makers itch that needed scratched. It was a long project that took 4 years to build and get on the road. I took my time and enjoyed all the detailed parts of the build. Again I loved all the little projects and spent lots of time daydreaming solutions along the way. This year is no exception. I started collecting materials to make a “Mega Den" for the boys... A sheltered hangout In the garden that we can escape too, we can draw, play games and pretend we are on holiday all while still in the garden at home. It needed to be bigger than the fort (another scrap wood project I made a few years ago). I found some windows free from gumtree, some old doors also from gumtree and they sat under a tarpaulin for over a year as I planned out in my head how I could use them. A chance discussion with a farmer saw me collecting 12 scaffold boards and I had enough to get started. 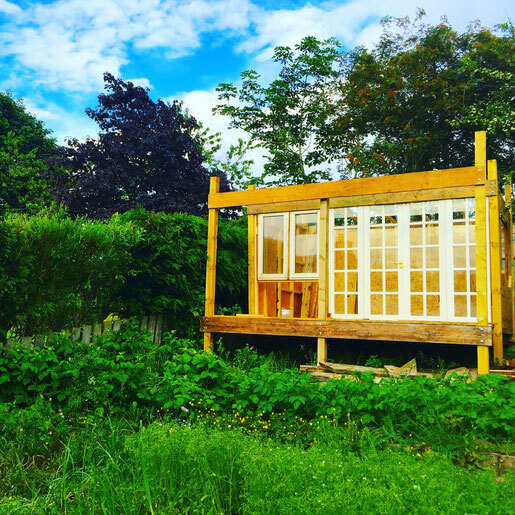 I have spent a few happy weeks and evenings sawing, hammering and drilling to get to the stage of something resembling a "summerhouse" no MegaDen in the back of the garden. Roofing materials arrive next week and it will be fully watertight and ready for action. Electrics arrived this week (thanks amazon prime) and a length of armoured cable that I have squirrelled away in the garage for over 10 years will see power running up under the grass for lights and sockets. A couple of weeks should see it finished and that will be another project completed, and I can stop thinking about. So yea, I have the makers itch and the only way to stop it is to keep on making. p.s. top marks if anyone knows the next line?